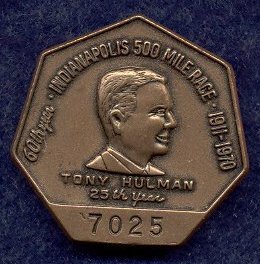 1970 marked Tony Hulman’s 25th year as owner of the Speedway and a badge with his likeness was made in his honor. Measuring 1 1/4" x 1 1/4" it is one of the larger badges of the 70's. 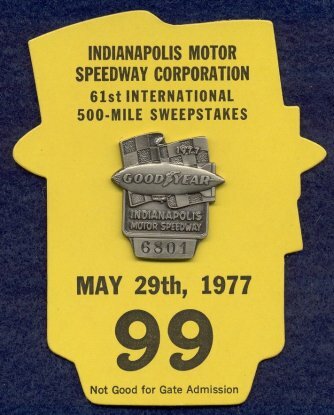 The 2001 badge is very similar to the 1970 except Ray Harroun is in place of Mr. Hulman. 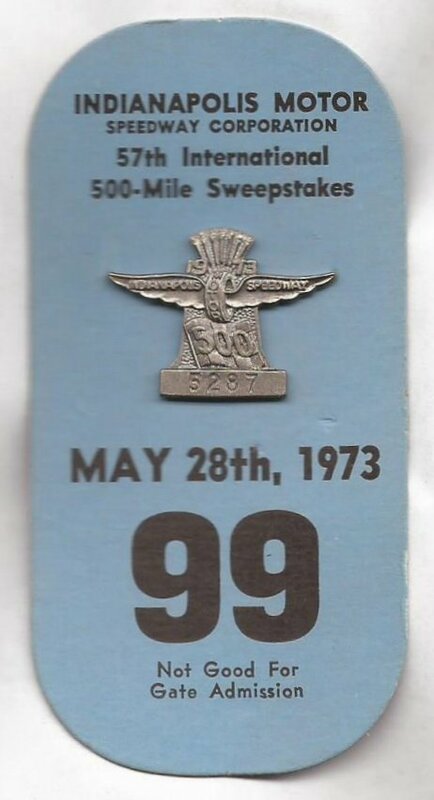 Note that the proof or salesman sample is numbered "0000" as are the 1971 and 1972 badges below. The lead casting below may have been used in making the final product or it is a fake. 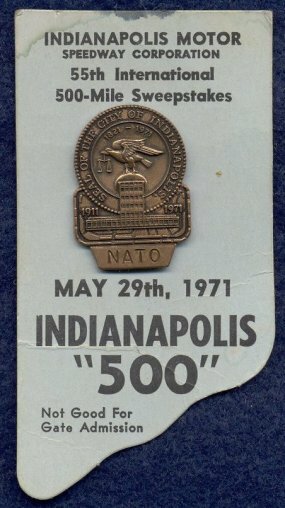 The city of Indianapolis was 150 years old in 1971 and the badge depicts the Control Tower with the seal of the city of Indianapolis behind it. The '71 measures 7/8" x 1 1/3". Note that the proof or salesman sample is bronze and not silver. 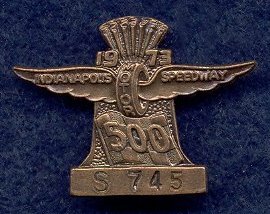 Also in 1971 Indianapolis was host to the NATO (North Atlantic Treaty Organization) International Conference of Cities and to commemorate that, the Speedway issued a special NATO pit badge in BRONZE ONLY. The 1971 NATO badge is by far the toughest badge to find of the 1970's and also the most under-rated as it should rank up with the big 5 as it is believed 500* or less were produced. The back up card is just as rare (see the Back Up Card Page for more info). 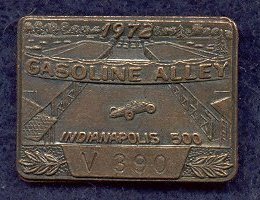 The 1972 badge measures 7/8" x 1 1/8" and depicts Gasoline Alley from a slightly over head angle. By 1972, Gasoline was no longer used so it was more tradition than anything that it was still called "Gasoline Alley". 1972 also marks the first year where bronze badges only carry a letter followed by a number. 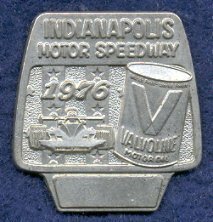 The 1973 badge uses a smaller version of the "Wing and Wheel" design and a checkered "500" flag below. The '73 comes in at 1 1/4" x 7/8". 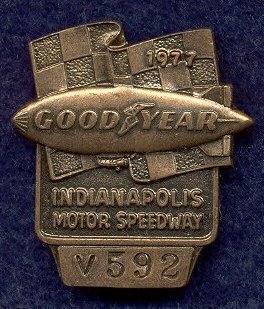 The 1974 badge is triangular in shape and depicts the Speedway from a southern aerial perspective. There is NO Bastian Bros. name or logo on the back. 1974 measures 1 1/4" x 1 1/3". 1976 is a can of Valvoline motor oil at right and a race car. The United States celebrated its Bicentennial in 1976 which is noted by the stars and stripes behind the race car. The size is 1 1/8" x 1 1/4"
An example of a blank "proof" from 1976 is below. Although faint, the Bastian Bros. marks are visible. It is also possible this could be a fake. For 1977 the Goodyear blimp is superimposed on a waving checkered flag for the badge. 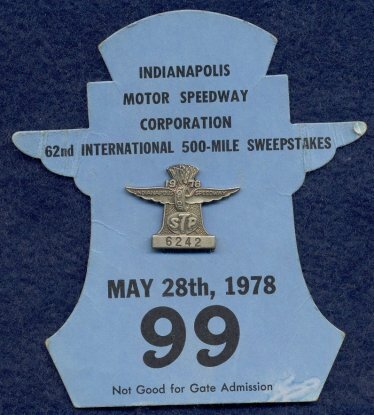 It measures 1 3/5" x 1 1/4"
The 1978 badge is the same size and design as the 1973 except the sponsor STP is in place of the ‘500’ flag. Due to the similarity between the 1978 and 1973 badges they are sometimes are confused with each other. A speeding race car coming at you above the Loctite logo is the design for the 1979 badge. 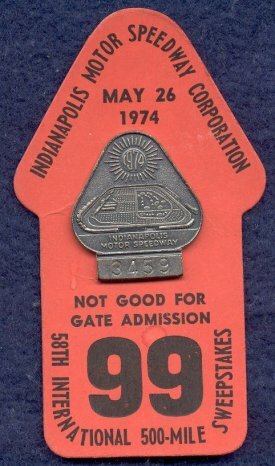 The '79 comes in at 1 3/5" x 1 1/4"
The 1970 through 1979 badges become even easier to find. The 1971 NATO badge is by far the toughest badge to find of the 1970's and also the most under-rated as it should rank up with the big 5 as it is believed less that 500* were produced. A far distant second would be the 1970 and 1977 silvers.